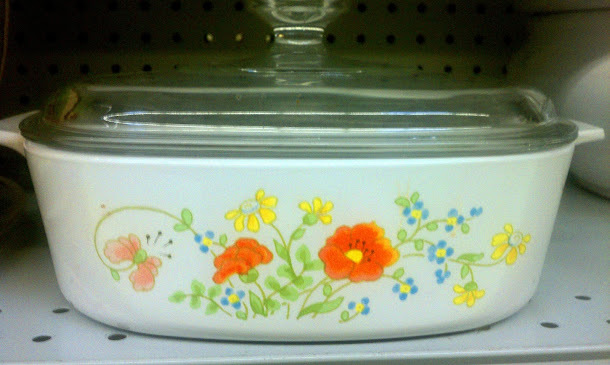 The "Wildflower" pattern, produced from 1977 to 1984. A fairly common pattern, or at least it seems that way to me. My mom had one of the "Counter Saver" with this print down in the bottom right hand corner. She use to roll out her pie dough on it all the time. Sadly, they always seem to be chipped or broken when you find them in a thrift store. I think this flower pattern looks great on this. Very bright and looks really decent. A little designing always looks better than simple crockery .